Choosing Feldco for your vinyl siding installation in Chicago is the smartest choice you can make as a homeowner for two reasons. The first reason is because our vinyl siding is the most energy efficient. The second reason being we’ll offer the best professional vinyl siding installation in Chicago. Double four siding– Also known as standard, this is the most common design of vinyl siding. Dutch lap siding– Similar to double four, except with a decorative groove to add dimension. Board and batten siding– Achieve a unique look with this style. Alternating widths of vertical siding add a crisp look. Vertical siding– One of the more contemporary styles. Sleek, vertical lines can truly transform the look of your home. Shake siding– Shake siding is made to look like traditional cedar or shingles. This style provides a unique look and great curb appeal. Scalloped siding– Softer lines and a curved design creates a unique accent for your home. Often used on smaller areas of a home. 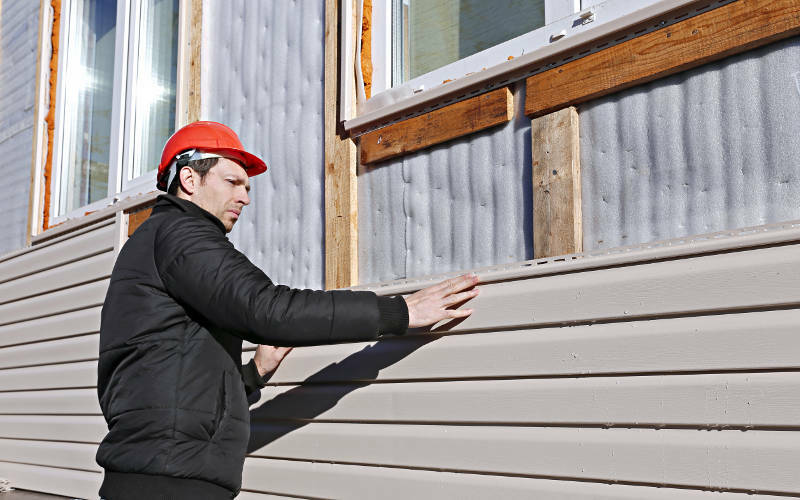 Installing new siding on your home is a big project. The siding installers for your project will ensure that your vinyl siding is correctly installed the first time. In order to maximize the energy efficient qualities of Feldco vinyl siding, installation needs to be done to perfection. Every siding installer is a true expert and has mastered the techniques necessary to make sure your Feldco siding performs the way it should. Measurements are the crucial beginning to vinyl siding installation. The first round of measurements will take place during your in-home demo. This is followed by another round of measuring by a Measure Technician to ensure accuracy. Getting two sets of measurements is an extra step we take in providing excellent siding installation. The siding contractors that’ll be installing your new siding are among the best in the home improvement industry. We’ve proudly worked on over 350,000 siding projects in the Midwest. Your vinyl siding installers have been in the industry for many years and have the experience necessary to install your vinyl siding efficiently. They’ve familiarized themselves with our products over the years and can provide a smooth transition in transforming your home. Proper installation is key to having energy efficient vinyl siding. From measurements to clean-up, your experience with Feldco will be a positive one. The installers will treat your home and yard with respect and will carefully clean up after installation is finished, leaving your home looking beautiful. Vinyl siding installation in Chicago is a complex and extremely detail-oriented process that needs to be done by professionals to ensure everything is done correctly. By choosing Feldco for your vinyl siding, you’re not only getting the best product but also excellent installation. Start your siding project today with a free quote online or by calling us at 866-4FELDCO!